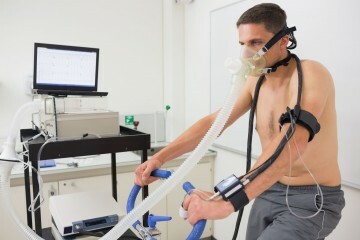 An exercise tolerance test assesses the effects of exercise on your heart. This lets the doctors know how healthy your heart is. You will need to wear loose, comfortable clothing that is suitable for exercise. You should also wear comfortable, flat shoes or trainers. You might find you feel sick, so it is best not have anything to eat or drink for 2 to 3 hours before your test. Make sure you bring any heart medicines with you to the test. First of all, electrodes will be attached to your chest. These monitor the electrical activity of your heart while you exercise. Also, a cuff will be placed around your arm to measure your blood pressure every few minutes throughout the test. You will then be asked to walk for a time on an exercise machine (treadmill) and you may also be asked to use an exercise bike. There will be handlebars on either side of the treadmill that you can hold until the test starts. The speed of the treadmill will gradually increase throughout your test and the incline will also rise. The test will continue until you have reached your peak heart rate or until you feel tired or dizzy and if you feel any chest discomfort or shortness of breath. Please be sure to tell the staff as soon as you have any of these symptoms. Once the test has ended, the treadmill will gradually be slowed to a stop and you will be helped to a chair or bed. Your heart rate and blood pressure will be monitored for another few minutes until your heart rate recovers. The test can take up to 45 minutes – this includes everything: the preparation time, the test itself and the period of recovery. Before you leave the hospital after your exercise tolerance test, make sure you have an appointment to come back and see your doctor for the results.